The five senior members of the Afghan Taliban who were freed from the Guantanamo Bay prison camp in exchange for Army Sgt. Bowe Bergdahl in 2014 now face American diplomats and military officials in peace talks over the terms of an American troop withdrawal from Afghanistan. The Taliban has been sure to involve the former prisoners in the talks, including each day during the recent round of negotiations with American diplomats and generals in Doha, Qatar, the New York Times reported Tuesday. "During our time in Guantanamo, the feeling was with us that we had been brought there unjustly and that we would be freed," one of the former prisoners, Mullah Khairullah Khairkhwa, told the Times. "But it never occurred to me that one day there would be negotiations with them, and I would be sitting there with them on one side and us on the other." Khairkhwa and four other fighters were held at Guantanamo for 13 years, before the Obama administration released them in a prisoner exchange for Bergdahl, the only known American soldier who the Taliban kept as a prisoner of war. Bergdahl walked off his base in 2009, when the Taliban captured him and subsequently held him prisoner for five years. In October 2017, Bergdahl pleaded guilty to desertion and misbehavior before the enemy. President Donald Trump addressed the prisoner exchange in 2016, when he was running for the Republican presidential nomination in Iowa. Trump criticized former President Barack Obama for freeing the five fighters. "You look at these deals," Trump told NBC host Chuck Todd. "I always bring up Bergdahl. We get a traitor, they get five people that they've wanted for [years], and they're back on the battlefield, trying to kill everybody, including us. And we get a dirty, rotten traitor." 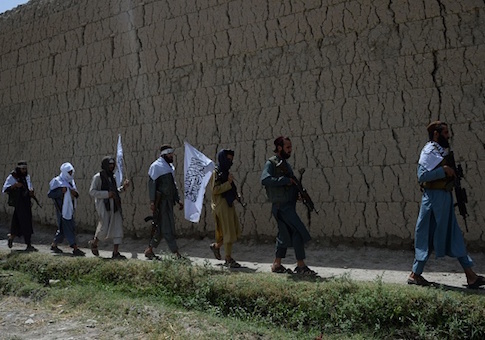 For the Taliban, the conflict with the United States is still very much alive, even as the two sides work through peace talks. "It’s been a long war, with lots of casualties and destruction and loss," Khairkhwa told the Times in an interview after the latest peace talks ended. "What gives me hope is that both teams are taking the issue seriously. On every issue, the discussions are serious, and it gives me hope that we will find a way out—as long as there are not spoilers to ruin it." This entry was posted in National Security and tagged Afghanistan, Bowe Bergdahl, Taliban. Bookmark the permalink.